Bekommt Ihr für Eure Leistungen auch nicht das Lob, das Ihr erwartet? 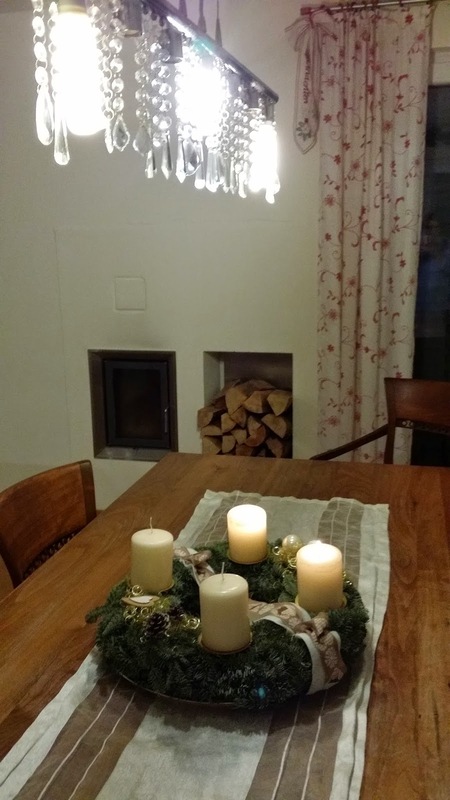 Denn gestern saß unsere Familie gemütlich zusammen beim Abendessen in unserer weihnachtlich angehauchten Küche. Leider verlief unser Abendessen nicht so friedlich, wie wir es uns gewünscht hätten, denn eine späte aber umso aufgewecktere Fliege flog ständig mit lautem Surren um uns herum. Und obwohl wir normalerweise Tierfreunde sind, war die Fliege dermaßen lästig, dass wir sie lieber nicht mehr lebendig gesehen hätten. Wir unternahmen alle mehrere Versuche, dem Leben der Fliege den Garaus zu machen, jedoch sehr lange ohne Erfolg. Schließlich, als wir alle praktisch schon völlig entnervt waren, gelang meinem lieben Mann endlich der entscheidende Schlag. Was nervt Euch? Was versucht Ihr öfter ohne Erfolg? Welche Eurer Leistungen werden nicht gewürdigt? Do you get for your achievements also not the praise you expect? Yesterday our family sat together at dinner in our kitchen with Christmassy touch. Unfortunately, our dinner was not as peaceful as we would have liked, because a late but all the more alive fly flew constantly with loud whirring around us. And although we are usually animal lovers, the fly was so annoying that we would have preferred it to see the fly not alive. We all took several attempts to bring the life of the fly to an end, but a very long time without success. Finally, when we all practically were completely unnerved, my lovely husband was able to succeed the decisive blow. In the sudden silence, my lovely husband said to my son, "So! I defeated the fly! You can praise me now." Our son looked only indulgently to my husband and replied: "Oh, Dad, quite honestly, I think this is not necessary. Because you definitely achieved already bigger things." What annoys you? What are you trying often without avail? Which of your achievements are not appreciated? Dear Rena, you look absolutely gorgeous in this outfit! I really loved your printed coat, the bright colors are looking so pretty on you. those boots are really gorgeous! This printed coat is great!! Thanks, I’m sure that you you decorated with your good taste your home wonderful! Fantastic coat and cute look Rena! Kisses. Ugh, I hate flies too! They're everywhere! Anyway, your post is so well-written :) Really great. You definitely shouldn't be surprised if someone complimented your outfit, it's really pretty! So unique, and your bag is gorgeous! Dein Outfit ist schön herbstlich, mir gefallen die Stiefel ganz gut! Dein Mann als Fliegenfänger, ja da fängt das Lob bei meinem Kater an, ich habe eigentlich nie Fliegen in der Wohnung, weil der Kleine alles fängt. Lob ist so wichtig, man sollte nie damit sparen, ich gab auch als Lehrerin schlechteren Schülern immer ein Lob, denn etwas Gutes findet sich in jeder Arbeit, findet man sie auch schlecht, alleine die Mühe muss belohnt werden, darum gab es von mir Stempel mit Tierchen in's Heft, das Schweinchen benutzte ich fast nie, weil - Siehe oben. Gelobt werde ich selten, aber ich nehme es so, kein Geschimpfe ist für mich wie ein Lob. Such a gorgeous outfit - I am in love with that coat, it's beautiful and so colourful!! I also really love the decoration in your Kitchen, it's so lovely and festive!!! Thank you so much, dear Layla! Wishing you and your family also a wonderful week, we are fortunately all well and we are getting ready for Christmas :) I hope you are also well. Da hat Deine Mama aber einmal mehr Euer mega Lob verdient! Ich habe manchmal das Gefühl, dass die Leute, die viel Autofahren müssen, es eher nicht lieben, und die Menschen, die nicht so viel fahren, finden es eher toll … ich verstehe es absolut, dass es nicht Deine liebste Beschäftigung ist. Vor allem geht einfach unwahrscheinlich viel Zeit drauf. gibt es bei euch nicht so einen spruch: nix gesagt ist lob genug? den Spruch, den gibt es definitiv und er wird in meiner Umgebung auch durchaus angewandt. Du gehst ja praktisch schon selber als Bayerin durch, auf jeden Fall, was die (Un-)Sitten und Gebräuche bei uns hier so anbelangt! Wobei Du meiner Meinung nach auch von einem Bayern generell viel mehr Lob verdienst als Dir dieser Bayer zukommen ließ! Denn ich finde, so gescheite, tüchtige und schlagfertige und dazu noch schöne Menschen wie Dich kann man gar nicht oft genug loben. Oder hat er Dich deswegen nicht gelobt, weil er mit Dir nicht mithalten konnte? also was Du schreibst, erhärtet meine zuletzt aufgeführte Vermutung <3 Hm, wieder kein Enthusiast? Da denke ich jetzt gerade nach ... und hoffe, zumindest dieser Hanseat ist mit Dir auf Augenhöhe. Denn ich würde Dich wirklich loben, loben, loben und ich bin aus Bayern! Wow your floral coat is amazing, such a fun and original winter piece! Your floral coat is amazing Rena, great piece!!! And I love your x-mas decorations!!! Wow! Really amazing coat! Super! My dear Re a this is one of my favorite look..Love every single cetail, especially your Prada bag..( absolutely to die for..). Oje, die arme Fliege. Sie hätte bei mir vermutlich auch nicht lange überlebt, obwohl ich eigentlich keiner Fliege etwas zu Leide tue. Da bin ich überzeugt davon, dass Du keiner Fliege etwas zuleide tust, denn Du bist auf jeden Fall lieb, liebe Sabine! That coat!! What a unique print! I like that you paired it with a classic dress! That jacket is so unique, and colorful! dir steht dieser Mantel ausgezeichnet, das ganze Outfit ist mehr als gelungen. Leider seht mir so bunt gar nicht. Ich versuche immer die Fliegen usw. nach draußen zu lotsen, ich kann einfach keiner Fliege was zu Leide tun. Dir noch eine entspannte Vorweihnachtszeit. Das ist geschickt, dass Du Dich selbst lobst und ich habe gerade sehr schmunzeln müssen, denn während ich Deine Zeilen gelesen habe, ist mir aufgefallen, dass ich das in Bezug auf das von mir gekochte Essen ganz genau so mache wie Du :) Ich bin mir jedoch sicher, Du verdienst das Lob für Dein Essen – sowohl von Dir als auch von den anderen. Sehr lobenswert, dass Du versuchst, die Fliegen nach draußen zu lotsen, da nehme ich mir an Deiner Geduld doch zu gerne ein Beispiel. Dir auch noch eine entspannte Vorweihnachtszeit. Wow, dieser Mantel ist wirklich der Hammer!! Sehr schick! Was this unexpected compliment from your husband? I do really like your outfit...wonderful boots! amazing dress and bag...and most of all I like that colourful coat...it is so perfect! I think nobody likes flies...even animal lovers...probably because of their habits to dwell on our food which everyone hates...so killing a fly was an achievement even if a small one...I'm sure your husband has more meaningful achievements in his life...like for instance having such a wonderful wife! You are right, dear Ivana, this unexpected compliment was from my husband :) Thanks for your lovely feedback, you make me happy! Honestly I don’t know anyone who likes flies … even animal lovers. Therefore I agree that it was indeed a little achievement of my husband that he caught finally the fly. I don’t know if you know in Croatia the Fairy Tale from the Brothers Grimm “The Brave Little Tailor” who caught 7 flies with one blow. The achievement of my husband remembered my namely on this Fairy Tale :) But I’m not sure if I’m a wonderful wife I know only that I really love my husband with all his characteristics. yes, I know of brothers Grimm and their wonderful stories. I often analyzed fairy-tales from a psychological (Freudian ) aspect when I was a student and my professors were always impressed with that...I think fairy tales have a lot to teach us, they preserve important mythological memories and oral traditions as well as wisdom of old. How wonderful that you analyzed the fairy-tales of the brothers Grimm from a psychological aspect as I often did the same! Before I analysed these fairy-tales I lived so to say with this fairy-tales as I read them again and again when I was a child. Like you I'm convinced that fairy-tales have a lot to teach us and I think they are really precious due to the important fact you mentioned that they peserve important mythological memories and oral traditions as well as wisdom of old. Your coat is something of amazing! So colorful and and so much flowers on it, a little reminder of summer! And your house is so cute!! Is not the first time that your husband liked and compliment your outfit, as a woman I know how flattering is and you deserve it because until now you showed only great outfits. In this period was warmer and here explain their presence. And floods in some cities in Romania after snowmelt. We still have mosquito netting. I think your explanation for the presence of the flies is really true. How good that you are protected with mosquito netting. We have also mosquito nets and use them nearly the complete year. such a well styled outfit! My dearest Rena, how beautiful your coat is, I wish I owe it:). You're beautiful lady and you definitely deserve to hear more often from others.... You look stunning with all the pretty color all around you:). Those boots are fabulous too and the so the Prada:).. I'm glad to hear you are enjoying your holiday season so far.. Thank you for sharing your decorated of your lovely family kitchen:). I've an extra busier on December as also our twins birthday today.. We've to shopped and wrapped everything twice so it's quite of work for only mom with two babies that the same ages, good news my husband taking the day off to help me getting through this special day of our twins...We have to get going and finishing our plans for the boys... wishing you a really very wonderful week so far beside a joy of pre Christmas with your loved ones my dear darling! A big kiss and warm hugs from me to you:). So sorry that you are again so busy, Christmas and birthday of twins, this is for sure more than a lot of work! How good that your husband is taking the day off to help you getting through this special day of your twins … I’m sure you will celebrate everything in the best and most lovely way! Wishing you also a wonderful week, thank you so much that you took again your precious time to stop by here <3 Enjoy the pre-Christmas period with your beloved ones my dear darling! Amazing coat, love your kitchen! sehr gemütlich sieht es aus in Deiner weihnachtlichen Küche! Sehr hübsch und geschmackvoll habt Ihr dekoriert. Und auch Dein Outfit ist wieder sehr hübsch und geschmackvoll, wie immer. Der Mantel ist ein absoluter Hingucker!! Wo findest Du nur immer diese besonderen Stücke?? Hm, ich weiß nicht, ob ich besondere Stücke habe, aber ich weiß, wenn ich wieder eine meiner Eingebungen habe und mir etwas einbilde, dann finde ich das normalerweise ziemlich schnell. Vielleicht liegt es ja daran, dass ich seit vielen Jahren als Einkäuferin arbeite? And your coat is so amazing but maybe too much for me, not sure I would dare to wear something so colorful! Liebe Sabina, danke! Oh, das ist so genial, was Du mir extra schreibst und vor allem warum! Auch wenn Du recht hast, mit Deiner Vermutung, dass es mich nicht sooo überrascht. Vor allem finde ich es einfach einmal mehr eine wunderbare Bestätigung dieses geistigen Gesetzes, von dessen Richtigkeit ich überzeugt bin :) Abgesehen davon hast Du das Kompliment für Deine Jacke ganz sicher mehr als verdient. Hab ein schönes Wochenende, kommen wir in den Genuss Deinen Adventskranz zu sehen? LG nach Frankfurt sendet Dir Rena, die sich Dir - obwohl wir uns nie getroffen haben - sehr nah fühlt. You always manage to impress me with your incredible sense for style. All your outfits are so trendy with your own twist of elegance. Loving this one! I love the colours in your coat. Ich sende Dir einen grossen Kuss, Rena! I fear you don’t achieve what you deserve … at least I recognized how hard working, clever and beautiful you are – and this impresses me a lot! Ich sende Dir einen großen Kuss, Elena! I would compliment you on this outfit in a heartbeat...watch me! I love this look, especially your AMAZING coat. It's fantastic. Sometimes a person needs positive praise regardless of how big the action. Thank you so much <3 And I agree to 100 % to your statement in the last sentence as this is really wise from you. Maybe it' s good to my skun that do not wear make up 3 days?! Thanks, especially that you are so sweet to me <3 So sorry you got a bad flu and your nose is red. How good that you at least see the advantage for your skin, I’m sure you are right with your assumption. And I can' t belive that you have all ready older kids that I have cause you look so young in the good way ! Adult, But so chic!! You are too kind, thank you <3 Your feedback makes me blushing and I think I have to thank especially my good photographers which is mostly my husband. Super schöner Post, das Outfit steht dir total gut! Ich liebe es wie du diesen farbenfrohen Mantel während dieser Jahreszeit trägst. Die Farben deiner Stiefeln passen perfekt zu den schönen Blättern im Hintergrund. Danke, liebe Mahshid, Du bist wieder so lieb! Ich mag unsere Küche auch sehr gerne, was gut ist, denn ich verbringe recht viel Zeit in diesem Raum. Das kann ich mir vorstellen, dass Dich das schöne Wetter in New Zealand nicht so ganz extrem in Weihnachtsstimmung versetzt … wünsche Dir trotzdem von ganzem Herzen eine wundervolle Zeit dort. Daaanke! Da freu ich mich riesig über Dein Feedback, sorry, dass Du meistens erst mal immer “WTF” denken musst … Deine darauffolgenden Reaktionen sind allerdings kann in meinem Sinne :) Und ich denke ich darüber nach, warum mein Look typisch ich ist, denn ich selber weiß gar nicht, was für mich typisch ist. Absolutely in love with this post!!! Love your look! Ein soo schicker Look! Die Tasche ist super! This bag is really beautiful <3. Love the color of your shoes too ! You look so pretty!!! I love your coat!!! what a beautiful coat! i love bright pieces like that. and it goes so well with your understated dress. Love it your colorful coat Reina! such a fabulous coat, love it! "Welche Eurer Leistungen werden nicht gewürdigt?" - wünschte mir, daß mein Blog weitere Follower bekommen würde: mehr Präsenz = bessere Verbreitung des Cross-Dressings. Meine Frage an dich: hast du schon Erfahrungen mit künstlichen Fingernägeln gemacht? 2. Vielleicht klappt es ja doch irgendwann, und es ehrt Dich, dass Du es immer wieder versuchst. 3. Das wünsche ich Dir und dem Cross-Dressing ebenfalls von Herzen! Noch nie, und ich bin mir auch ziemlich sicher, dass das gar nichts für mich ist. Ja, dann verstehe ich, warum Du auf die Nägel verzichtest.